Most of the general dashboard functionality is accessible via the dashboard header at the top of the window. Dashboard Title – The dashboard title is to the right of the EQuIS Enterprise version and may be modified in the Dashboard Editor. The Dashboard Title is restricted to 250 characters. Dashboard Description – A description of the dashboard can be added by the user and may or may not be present in the dashboard header. The dashboard description may be modified in the Dashboard Editor. Session Facility Chooser – The Session Facility Chooser is indicated with the facility icon or the facility group icon. If a facility or facility group is selected, the name will be displayed next to this icon. When a facility or facility group is chosen in the Session Facility Chooser, all widgets on the dashboard will update for the selected facility or facility group. Selecting the facility name or the facility icon on the current dashboard header will open the Facility Chooser, where the user can choose a different facility or facility group for the session. If a default facility is set for the dashboard, the Session Facility Chooser and facility name will not be displayed. The default facility setting can be changed by editing the dashboard. 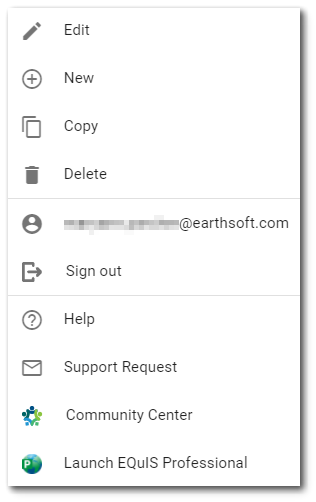 More Options – Selecting the More Options icon on the right-side of the dashboard header opens a drop-down menu that presents the user with the ability to change dashboards or dashboard properties, view user properties, access help, or logout. Choose Dashboard – Click on the Choose Dashboard button to open the Dashboard Chooser and change dashboards. Edit – Selecting the Edit menu option will open the Dashboard Editor screen for the current dashboard, where the user can set or toggle favorite facilities; modify the title, description, and color theme; and add or delete a dashboard section or widget. New – Selecting the New menu option will create a new dashboard, which will be available for editing. A default dashboard title will be generated based on the user name and date. Copy – Selecting the Copy menu option will copy the current dashboard into a new dashboard, which will be available for editing. A default dashboard title will be generated based on the current dashboard title, user name, and date. Delete – Selecting the Delete menu option will delete the current dashboard. The user will be prompted for confirmation. This option is only available to users with proper permissions. Note: This will delete the dashboard for all users. Username – Selecting the user name next to the user profile icon will open the User Information window. Logout – Selecting the Logout menu option will logout the user from the current EQuIS Enterprise session. View Documentation – Selecting the View Documentation option will direct the user to the EQuIS online documentation. Get Help – Selecting the Get Help menu option will open a new browser to permit the user to submit a Support Request form. Visit Community Center – Selecting the Visit Community Center menu option will direct the user to the EarthSoft Community Center. Note: Some properties may not be available on the dashboard. This is dependent upon how the dashboard has been configured and permissions granted for the dashboard.